Despite being in the busy Shinjuku district of Tokyo, Ochiai is a quiet neighbourhood with a small town feel and artistic atmosphere. The Ochiai neighbourhood is where two major rivers in Tokyo converge, the Miyoshoji and Kanda. This geography allowed a lively fabric dyeing community to flourish in the Edo period. Even today, many artisans continue to create and exhibit their artworks in the area. In February every year this history is celebrated through a local three-day festival called Somenokomichi. 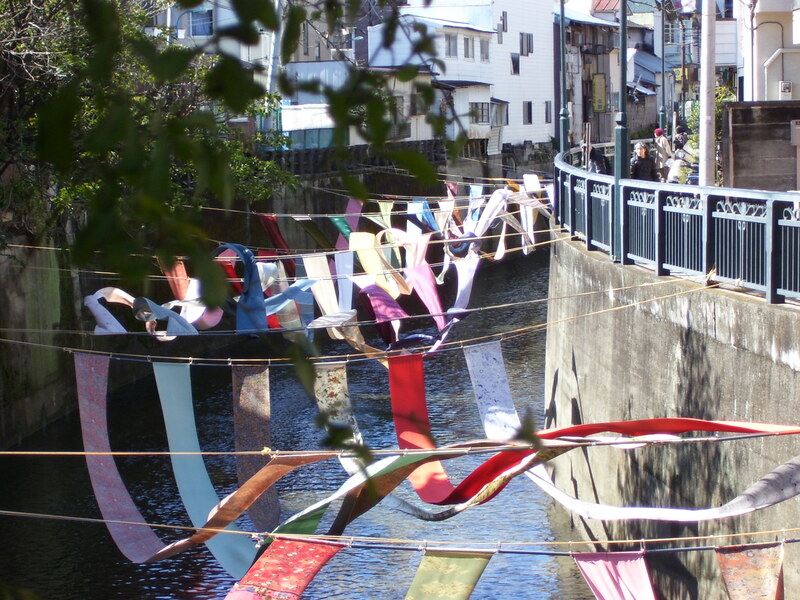 The festival really involves the whole community, decorates the streets with a River Gallery and Noren Gallery, and attracts many visitors including dyeing professionals from all over Japan. The neighbourhood is also home to the literary figure, Hayashi Fumiko and animation artist Akatsuka Fujio. A handmade english cafe/bar serving english food and mugs of tea in a Tudor style Tearoom. Lunch menus and evening menus with various beers and wines. They do very nice scones on Saturday afternoons.